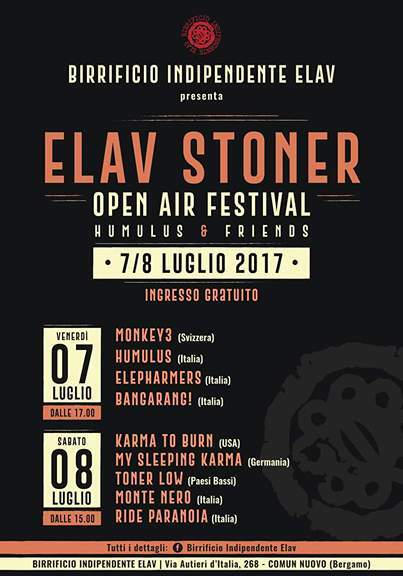 Pretty impressive lineup that Italian heavy rockers Humulus have put together in conjunction with Elav Brewery for what’s being called Elav Stoner Open Air 2017, with Monkey3 and Karma to Burn headlining and performances locked in from Humulus themselves as well as Toner Low, My Sleeping Karma, Monte Nero, Ride Paranoia, Elepharmers and Bangarang. It’s a two-night affair, and one assumes that since it’s actually being held at the brewery itself it’ll be as much a party as it is a show, but all the better for the heavy and psychedelic vibe that seems to be the event’s ultimate aim. Four bands tomorrow, five on Saturday. I know it’s kind of a crapshoot to think you’re going to be able to make it out to this one on such short notice if you didn’t already plan to go, but consider this notice at least that cool stuff like this is happening somewhere on the planet. On the most basic level, ideas like this one seem worth supporting to me. It looks like a good time. The Brewery opens the doors for the Stoner event of the year. The billboard took shape under the artistic direction of the Humulus, power trio Psych-Stoner of Brescia / Bergamo. Guest star of Karma to Burn, US trio that with their rock instrumental stoner will explode the stage! Stoner rock band from Cagliari, two guitars with heavy tuning, battery and voice. The sound of the trio brings with it the teaching of the Black Sabbath, the “cosmic” blues of the 60s and 70s, the groove of the stoner of the ’90s. The Elepharmers sound continues to have a sabbatical matrix, but with respect to the first album the songs are longer and more dilated, there are more instrumental parts and the arrangements are richer, thanks to the presence of acoustic guitars and synth arrangements and hammond By Matteo “Baro” Paper. Quartet with a loud rhythm, a strong ironic vein and the lyricism of the sampler that becomes a sort of “virtual singer”. The Bangarang Concert! Is littered with voices, noises, quotes, and dialogues around and inside the songs. In 2016 the Bangarang! Come back with a new work in the studio: ten tracks that go to create RELIGION CATODICA, an album that tells the many aspects of Italian television, for good and for evil, and which leads to the extreme consequences of the fusion of the power of a schizophrenic power trio And the quotation of the sampled voices. With their rock instrumental stoner they are ready to blow up the stage! For more than 20 years, the US trio proposes a rock stoner that is for all such lovers a solid and historic reference point; With their latest EP “Mountain Czar” Karma To Burn propose another wave of what they like to call “Mountain Rock” … and we are ready to make us invest in this mountain of increasingly aggressive and rhythmic riffs . Aschenburg’s rock psychedelic German group, with 4 studio albums behind and a lot of live experience. With their new album “Moksha” and a series of live sold out across Europe, My Sleeping Karma arrives at the Brewery together with their instrumental rock, a real journey out of the mind: hypnotic atmospheres, engaging guitar riffs and a Massive dose of rock that never breaks. Band Doom Stoner who released the third album “III” in April 2013 on Bilocation Records / Kozmik Artifactz and Roadkill Rekordz. The band features a rock stoner characterized by very low and rhythmic obsessive frequencies typical of the doom, which live become a real space trip. The Monte Nero project is a unique Distinct Music Moloch. After 15/20 years of ripening in various cellars, dance halls and stages throughout Italy, some operative musicians from rock band Bergamo (Gea, Spread, In The Howling Storm) are transferred to the BDC Room by Stefano Locatelli To spend another two years of maturing. Then, when the elements have reached full maturity, they blend together to create rock songs with a rich, intense aroma and full and round flavor. A rock band from Brescia, born in 2014, is the meeting between the two completely different music companies. Claudio, Davide, Andrea and Marco are part of The Credo band, which has been active since 2006, the fifth element of the band is Giovanni, eclectic guitarist, formerly a member of the French Wine Coca and Waiver. The result of this sound fusion has given rise to the sound of the Paranoia Ride, explosive mix of stoner, garage, rock, embellished with a touch of electro. This entry was posted	on Thursday, July 6th, 2017 at 6:05 am	and is filed under Whathaveyou. You can follow any responses to this entry through the RSS 2.0 feed. You can leave a response, or trackback from your own site. There goes another 0.269 seconds.